PhotoFiltre is a free image editor that makes a great lightweight alternative to Photoshop for users who want something more simple and easy to use. PhotoFiltre is a relatively small application and unlike Photoshop, will install and launch very quickly. The interface, loaded with all the features and options, can be confusing at first glance but you'll soon get used to it. The right side is composed of the shape and drawing tools and an optimizable color palette. 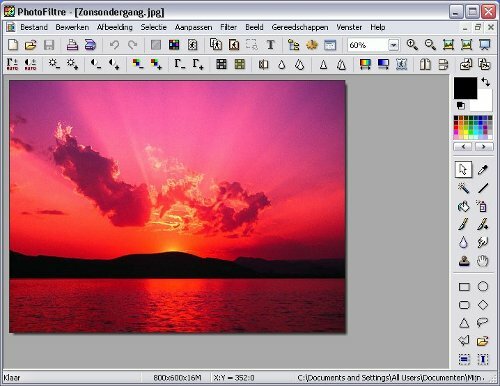 The top bar has all the essential image editing and modification options. PhotoFiltre sadly doesn't let you customize the interface and choose your favorite tools.Among all the image modification tools, we particularly liked the quick contrast/hue and saturation buttons because you can check out the effects and immediately and easily correct the image if you're not satisfied with its quality. If you trust PhotoFiltre, you can also let it adjust these parameters automatically.